Most ablation will occur at the snout or terminus of a glacier, which is usually its point of lowest elevation, where air temperatures will be highest and where iceberg calving may occur. The rate of mass loss (ablation) will decrease with elevation, as atmospheric air temperature falls with altitude. Accumulation may be more uniform over the surface of a glacier, but will tend to increase with elevation. 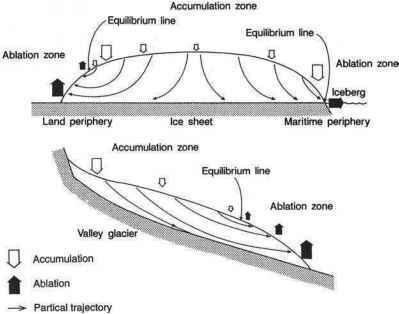 A glacier or ice sheet can, therefore, be divided into two areas: (i) an accumulation zone, where accumulation exceeds ablation; and (ii) an ablation zone, where ablation exceeds accumulation (Figure 3.3). The line between the accumulation zone and ablation zone is known as the equilibrium line; along this line accumulation is balanced by ablation. the accumulation zone to the ablation zone, thereby reducing the surface slope of the glacier and therefore the stress imposed on the ice. This transfer maintains the glacier slope at a constant or equilibrium angle. It is the gradient therefore between accumulation and ablation across a glacier that causes it to flow. The larger this gradient the greater the glacier flow required to maintain an equilibrium slope. This gradient is known as the net balance gradient and is defined as the increase in net balance (accumulation minus ablation) with altitude; that is the sum of the rate of increase in accumulation and the rate of decrease in ablation with altitude. 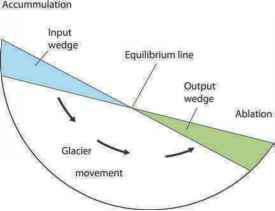 The higher the net balance gradient, the thicker the wedges of accumulation and ablation in Figure 3.4 will be, and as a result the more rapid the glacier flow must be to maintain a constant or equilibrium slope. The net balance gradient will be high on glaciers that have high rates of accumulation and large amounts of ablation. 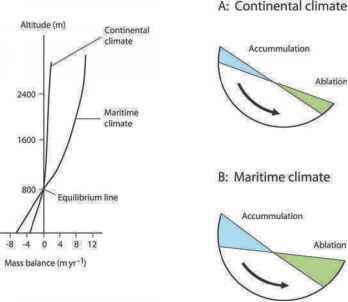 It will therefore be steepest on glaciers that experience warm damp maritime climates and lowest for those in cold dry continental areas (Figure 3.5). Consequently glaciers located in continental areas will flow more slowly than those in warm maritime areas. The rate of glacier flow varies from one glacier to the next and much of this variation is due to differences in the net balance gradient between different glaciers. What is mechanism of glacial erossion..?